Well, we officially have an independent sitter! Remember when I said in this post I had a feeling it was coming soon? Sure enough, three days later (April 17th), our little one surprised me when she was able to hold herself up in a seated position for several minutes. I initially thought it might be a fluke, but each day she continues to get stronger and stronger and can now hold herself up for up to 15-20 minutes at a time before she gets tired. It's now been about a week since Claire has realized her new-found skill and she is loving this new position in which to play with all of her favorite toys! We just adore our little girl and have decided she is growing up way too fast! We were graced with some exceptional weather this weekend! I'm talking 90 degrees in April, exceptional!! And so we decided to give Claire her first taste of the pool! Because she has loved each and every encounter with the water so far, we were pretty certain she would love the pool as well. Indeed, our little water baby had a ball! And I have concluded that there is nothing quite as delicious as a baby in a swimsuit! Seriously. Nothing. This particular "first" of Claire's was accompanied by many enthusiastic loved ones, hundreds of snapshots and plenty of excitement! We are thrilled that she enjoyed it as there are definitely many more days of pool fun in our future! Here are some of my favorite photos from the weekend! Getting her first taste of the water with Daddy! This post has been a long time coming! And the truth is, because this project will be quite a lengthy one, I didn't want to share any before shots of our backyard until we were ready to begin the transformation. And friends, the time has finally come and we're ready to get this show on the road! Living in the area we do, outdoor living is essential. When we bought our home, having a good sized yard was high on our list of priorities. Even one that needed some TLC (as our definitely does! ), because if nothing else, we are able see past things in their current state to what we want them to be. We have so many ideas and inspiration for this space! What I am about to show you is our backyard today from two vantage points. We have done nothing besides normal maintenance since moving here. As you will see, it's got a ton of potential but our goal is to transform that potential into a beautiful outdoor oasis! It's a little rough, super plain and in need of some serious landscaping, but we have some awesome ideas! Some will take more time than others, so our expectations are that it will evolve somewhat slowly and probably not be totally complete for a few years. But with that said, we hope to start enjoying our yard soon as we start to make some big improvements! As you can see it's a hefty list, but one we're very excited about starting to check off!! Stick around because I will be updating our progress all summer long! Our girl tried rice cereal for the first time today! At our 4 month check-up we talked to our pediatrician extensively about when to start solids and all agreed that it would be best to hold off on them until 6 months, per the newest recommendations to exclusively breastfeed until then. 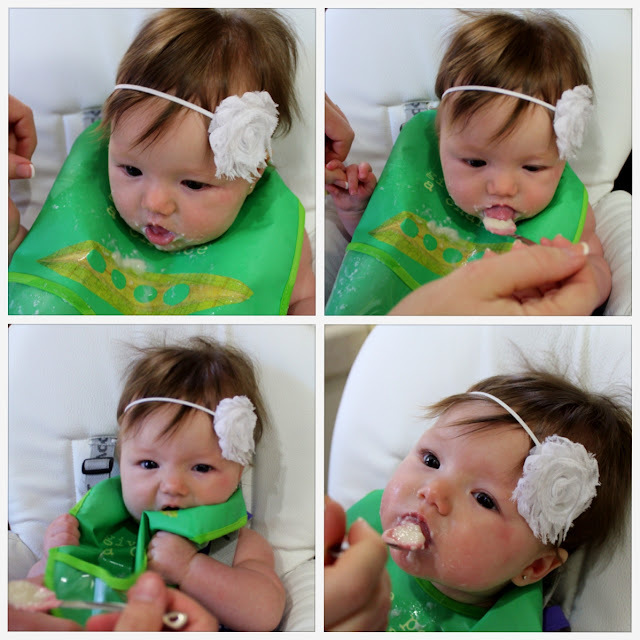 However, she did suggest that if Claire started showing interest in food between 5 and 6 months, that we could go ahead and try rice cereal since more than any nutritional value, it would be more like practice for eating solids. At the time she had absolutely no interest in food so we figured it would be a couple more weeks. And then sort of overnight she started grabbing at everything we put in our mouth and staring at us while we ate. So we decided to give it a try and let me tell you, she LOVED it! The whole thing was messy and hilarious and I'm so glad we were able to capture it on camera! From her first bite you could tell she wanted to eat the cereal, but had no idea what to do with it. After giving her a minute to get the hang of it we gave it another go and boy was she ready for more! 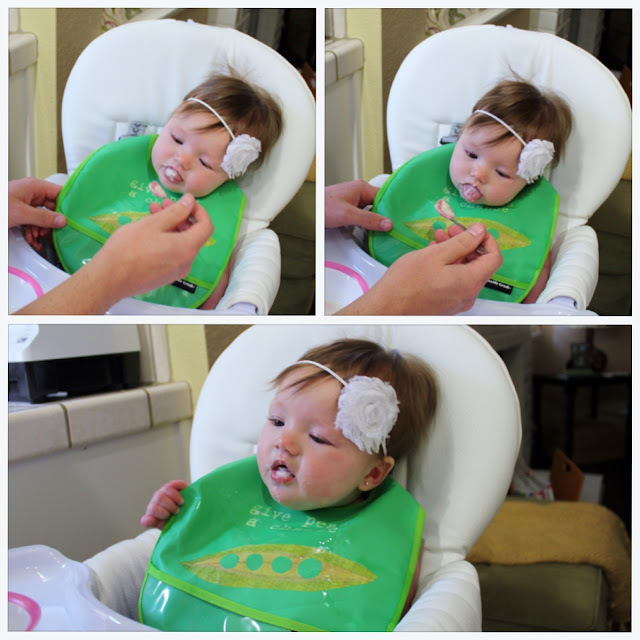 I can already tell this next phase of starting solids is going to be a hoot! Lookout because we're about to have an eater on our hands! Last Wednesday I turned twenty-six and I would have to say it was my best birthday yet! Because Chris worked that day and already had plans to celebrate my birthday that weekend, most of the day was spent with my mom and Claire. It was completely wonderful! We (Me, Chris, Claire and my parents) started with breakfast at my favorite little restaurant, Awful Annie's. Chris then went to work and us girls went to get a mani/pedi and do some birthday shopping! The day was concluded with P.F. Chang's take-out and some of my favorite sweets from Whole Foods. Definitely a lovely and relaxing day spent with my favorite ladies! The details of our weekend were kept from me until Saturday morning. The only bit of information that was divulged to me was that we would be away from Claire for the night, since Chris wanted to give me a chance to prepare and make sure she had enough bottles to get her through the weekend. I am a huge fan of being surprised and knowing that my hubby has taken care of all the details so my excitement and anticipation the week leading up to the weekend had me bursting at the seams! Before I was given any details, Chris took me to lunch at Jack's Urban Eats where he then shared what the weekend had in store. One of the many reasons I love that man is that when I least expect it, he completely blows me away with his thoughtfulness. He knew how nervous I was about leaving Claire for the first time, so instead of going anywhere far, we stayed in Downtown Sac at the Citizen Hotel. For one, after going to a wedding at the Citizen last Spring, I haven't stopped talking about wanting to stay there and second, he knew that I would be at ease knowing that if Claire needed us for any reason we were a short drive away. I adore him for being so intentional about details! After a delicious lunch a Jack's, we spent the afternoon walking through Capital Park, taking in the beautiful gardens and enjoyed the amazing weather the weekend offered us! About an hour before our hotel room was ready we happened upon the most delightful little french bakery, Estelle's. So darling and a perfect setting to relax and share a few divine French pastries! And as if I wasn't already feeling spoiled, upon checking in to our hotel the front desk informed us that they took the liberty of upgrading us to the top floor of the hotel, which offers the best views of the city! That evening we got dressed up and headed to the Delta King, where we would be attending the Suspects Dinner Theatre! We arrived about an hour early and had drinks on the deck. The entire evening was a blast and such a fun, unique outing! After sleeping in and leisurely enjoying our morning coffee, we decided to try out the hotel's restaurant, Grange, for their Sunday brunch and were delighted at the light, lovely fare they offered! Needless to say, we returned home that afternoon feeling so refreshed and recharged! Everything about our mini stay-cation was perfect and I could not be more grateful for the way I am loved and cherished by my husband! I am so happy he planned for us to go away overnight because as much as we LOVE our sweet daughter, we recognize how immensely important it is spend quality time together in order to keep our marriage healthy! Despite my nerves over leaving Claire overnight for the first time, I couldn't be happier with our decision! She did wonderfully with my parents, which has given us a whole new comfort level now that we know she (and mommy and daddy) can handle it! Cheers to another year and the wonderful blessing and adventures to come! Hi there friends! Has it really been almost a month since my last post?! I better watch out, that month passed way too quickly! I feel like there's been so much going on these past few weeks, but I guess the best place to catch you up would be with Easter this past weekend! Our Easter consisted of a beautiful service at our old home church ( we're currently on the church hunt again-ugh! ), which was so lovely because we were able to see so many people we haven't seen since Claire was born! And Chris and Claire's Gigi even joined us. As she is now 92, I love taking every chance we can to spend time with her! Church was followed by a lovely brunch at my parent's house, which we got to enjoy outside because it was a perfect 76 degree day! As it was also my mother-in-laws birthday, we took some time to celebrate her as well. All-in-all a completely perfect day celebrating Jesus' Resurrection!! On a funny note, Claire had us all cracking up at her reactions to the Easter baskets she received from her Daddy and me and both grandparents.While I realize she doesn't understand presents yet, she is totally into reaching for and grabbing everything she can get her hands on, which made for a hilarious scene with her Easter goodies. This girl was tossing and throwing headbands, bath toys and new outfits all over the place! What a cutie!! And of course, here are some pictures from our weekend!